____ WhereIsHolden? : Straight Talk on my future cars. Straight Talk on my future cars. Thanks to a friend, I found out that the normally quite harmless folks over at AutoBlogGreen have been carefully predicting my every move! The latest offence coming just a few days ago regarding my future automobile ownership (link). 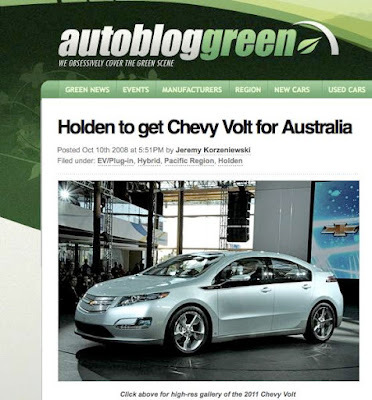 The screenshot below proclaims "Holden to get Chevy Volt"! Okay, honestly, I do realize that the Chevy Volt article is about the manufacturer's intentions to try to sell the Volt down under. But what I am saying is that even with my name slapped on the side of this particular electric vehicle, I will not be buying one. From what I saw at the Plug In America fundraiser recently (more on that to come), Chevy is missing the boat on this whole electric vehicle opportunity. More to come. I'm with you, number 2505 on Aptera's list! I have a 1996 Geo, 3 cyc. 5 Speed that gets 60 mpg, so few new cars interest me. The Aptera on the other hand would have kept my cost down last month, where business and pleasure meant driving 5,000 miles. Yeah its a good looking car, but for long distance drivers, the Aptera just makes sense! Good is where it's at.